Ernest Charles Manning was born September 20, 1908 in Carnduff, Saskatchewan, son of George H. Manning and Elisabeth M. Dickson. He was educated at a rural school outside Rosetown, Saskatchewan. After listening to many of William Aberhart's radio broadcasts, he enrolled in the new Calgary Prophetic Bible Institute in 1927. He was raised in a nominally United Church family, but became a committed Baptist during his time at the Institute. Quickly taken under the wing of William Aberhart, Manning became the Institute's first graduate in 1930. He remained with the Institute and began assisting and speaking on the Institute's radio broadcast "Back to the Bible Hour". While at the Calgary Prophetic Bible Institute, he met the pianist for the church and radio broadcasts, Muriel Preston. They married in 1939; the bride was given away by Premier Aberhart. They had two children, Keith and Preston. During the early 1930's, William Aberhart became interested in the social credit theories of Major C. H. Douglas. Although he had not expressed an interest in politics as a young man, Manning was also influenced by these theories and joined Aberhart in the promotion of the new Social Credit League. In 1935, Manning ran and won a seat in the Alberta provincial legislature under the Social Credit banner in the multi-member electoral district of Calgary. After the landslide Social Credit victory, Aberhart appointed Manning the portfolios of Provincial Secretary and Minister of Trade. He held these two cabinet roles from 1935-1943. After Aberhart's death in 1943, Manning was elected leader of the Alberta Social Credit League and Premier of Alberta. He won seven elections as Premier of Alberta and held cabinet positions of Provincial Treasurer (1944-1954), Minister of Mines and Minerals (1952-1962) and Attorney General (1955-1968). He resigned his seat in 1968. During his tenure as premier, oil was discovered in Leduc, raising revenues for the province. He was fiscally and politically conservative, and moved away from most of the social credit theories in which his party had been founded. Despite his busy schedule as premier of Alberta, Manning continued his involvement with the "Back to the Bible Hour," later known as "Canada's National Bible Hour". This radio program eventually was broadcast to over 90 stations in Canada. After sixty years of involvement in the radio broadcast, he turned the reigns of the show over to the Global Outreach Mission in 1990s. Manning also wrote a book, "Political Realignment: A Challenge to Thoughtful Canadians," published in 1967. This book endorsed socially conservative policies in the federal sphere and sold over 30 000 copies. 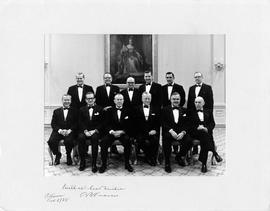 After his retirement from the Alberta legislature, Ernest Manning was appointed to the Senate of Canada in 1970 where he served until 1980. He was appointed to the Privy Council of Canada in 1967, Companion of the Order of Canada in 1969, and was honoured with numerous awards, certificates and honorary degrees. The community of Aurora, Alberta was renamed "Manning" after the premier. Ernest Manning died in Calgary, Alberta on February 19, 1996. Fonds consists of records created and collected by Ernest Manning over approximately sixty years. It contains speeches, newspaper clippings, publications, photographs, sound and video recordings pertaining to his political career with the Social Credit League and spiritual involvement with the Calgary Prophetic Bible Institute and the "Back to the Bible Hour". The fonds is arranged into three series, including: (I) Political papers, 1906, 1912, 1933-1983, (II) Spiritual works, ca. 1930-1992, and (III) Personal works, ca. 1940-1945, ca.1960-1980. Fonds was in the custody of Mrs. Muriel Manning, widow of Ernest C. Manning. It was transferred to the University of Calgary Archives by Mrs. Manning. Apart from a small amount of material placed in file folders or envelopes, there was no apparent arrangement of the records. Order has been imposed by the arranging archivist and most file titles have been created by the arranging archivist. The Provincial Archives of Alberta holds records pertaining to Ernest Manning in a variety of government records, including Office of the Premier sous-fonds, Department of Mines and Minerals fonds, Department of the Provincial Secretary fonds, Justice and Attorney General fonds, Executive Council fonds and Treasury fonds. The University of Alberta Archives holds the Ernest C. Manning fonds, a series of personal interviews conducted by Lydia Semotuk.